In the fourth quarter of the NFC Championship game, the Rams and the Saints were tied at 20. Drew Brees and the New Orleans offense were deep in Rams territory with 1:49 left to play. 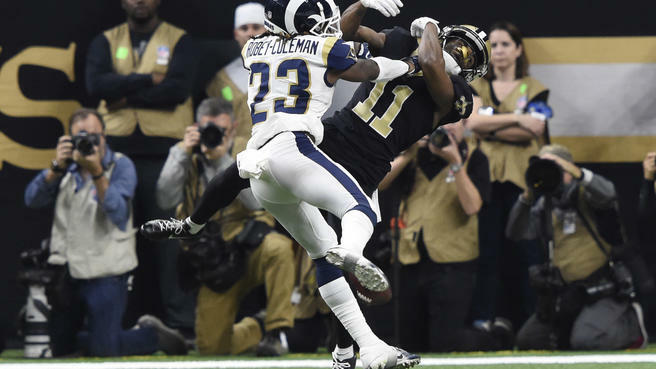 On a 3rd-and-10 pass, Rams cornerback Nickell Robey-Coleman ran directly into Saints receiver Tommylee Lewis, making helmet-to-helmet contact before the ball had even reached the Saints player. The Superdome erupted as the hit was made, and there was no flag in sight. New Orleans head coach Sean Payton could be seen running down toward one of the referees shouting “are you kidding me” as Saints players threw their hands up in the air looking for a pass interference call. No such call was made. The Saints had to settle for a field goal, allowing them to go up 23-20 with time left for the Rams to score. Had the flag been thrown the Saints would’ve been set up with a first down already in field goal range. The plan would’ve been to let the clock run on their next three consecutive plays and to kick the game winning field goal with little to no time left in the fourth, sending them to the Super Bowl. However, Los Angeles ended up getting the ball back and kicking a field goal as well, forcing the game into overtime. They eventually won, leaving the blown call as the talk of Championship weekend. Los Angeles cornerback Robey-Coleman was also swarmed with questions in regards to his hit on Lewis. He admitted that he initially thought a flag would be thrown on the play, but one of the refs thought the ball looked like it was tipped. He had not seen the replay of the controversial hit at the time, so the Washington Post’s Adam Kilgore pulled it up on his phone. “Oh, hell yeah,” said Robey-Coleman. “That was PI.” The Rams cornerback is facing a 26,739 dollar fine for his uncalled helmet-to-helmet hit. Talks of a possible rule change have since been underway. The Canadian Football League allows pass interference penalties to be challenged, and many are starting to believe that the NFL should too. For the most part, pass interference calls vary depending on the game, but this was one that shouldn’t have been missed. An anonymous NFL official told the Washington Post that rule changes “will be discussed at length” over the course of the off season. This wouldn’t be the first time that the NFL has adjusted their rules following a Saints NFC Championship game. In the 2009-10 season New Orleans defeated Minnesota in overtime by kicking a field goal on the first possession. Following that game, the NFL decided that if a team kicked a field goal on the first drive of overtime that the opposing team would get another chance to score.